Suicide and the Great Recession: Will we heed the tragic warnings? In this era of the Great Recession, suicide has become a leading cause of death in America, especially among the middle-aged, and it is to our shame as a society that this reality is not an ongoing, dominant focus of our attention. From 1999 to 2010, the age-adjusted suicide rate for adults aged 35–64 years in the United States increased significantly by 28.4%, from 13.7 per 100,000 population to 17.6 . . . . The suicide rate for men aged 35–64 years increased 27.3%, from 21.5 to 27.3, and the rate for women increased 31.5%, from 6.2 to 8.1 . . . . Among men, the greatest increases were among those aged 50–54 years and 55–59 years, (49.4%, from 20.6 to 30.7, and 47.8%, from 20.3 to 30.0, respectively). Among women, suicide rates increased with age, and the largest percentage increase in suicide rate was observed among women aged 60–64 years (59.7%, from 4.4 to 7.0). The report prompted a lot of media coverage upon its release, but now it has faded into the shadows of the news cycle. Arias further observed that the spike in suicide rates could be a reflection of a combination of stressors specific to baby boomers. As the sandwich generation, many of us, while fighting our own financial battles, are also taking caring of aging parents, many with dementia, and providing economic and emotional support to our adult children, who are having difficulties launching their own independent lives. Thomas H. Maugh II, in a 2011 piece for the Los Angeles Times, reported on an earlier CDC study indicating that among working people ages 25-54, suicides increase during bad economic times and decline during more prosperous times. Everyone is familiar with stories of businessmen jumping to their deaths from window ledges during the Great Depression. New data from the Centers for Disease Control and Prevention indicate that those stories, sometimes viewed as apocryphal, have a strong basis in fact: The rate of suicides rises during times of economic hardship and declines in periods of prosperity. Overall, the study — which did not distinguish between men and women — found that the suicide rate was 18 per 100,000 adults in 1928, the earliest year for which data are available, and climbed to 22.1 per 100,000 in 1932, the last full year of the Great Depression. That 22.8% jump over a four-year period is the largest in history. Since then, the suicide rate has been dropping, with much smaller increases at the end of Franklin D. Roosevelt’s New Deal (1937-38), the oil crisis (1973-75) and the double-dip recession (1980-82). The emotional costs of unemployment are vividly evident in a disturbing and important 2012 documentary, “Set for Life,” which tells the stories of Baby Boomers who have lost their jobs and who are trying to find work in the midst of our recessionary economy. “Set for Life” is the work of journalist and producer Susan Sipprelle, assisted by filmmaker Samuel Newman (bios here). It centers on the ongoing sagas of three fiftysomething individuals searching for work, supplemented by interviews with experts and information that put their stories in context. While the three main characters in Set for Life search for work in today’s daunting job market for older workers, they suffer financial woes, self-doubt, and health concerns. Thrust by the recession into a quest they never expected to face late in life, they ponder deeper questions that are relevant to everyone: What defines my self-worth? What is my definition of happiness? Can I reinvent myself? Can I prepare for and accept change? Ghilarducci’s comments appeared last year in The Week, a weekly news magazine, as part of an informative piece spotlighting a largely neglected Boomer retirement savings crisis. Unfortunately, most workers have not built 401(k) accounts sufficient to fund a comfortable retirement; the average 401(k) balance “is just over $60,000,” according to The Week. Even worse, “(m)ore than half of U.S. workers have no retirement plan at all.” Social Security payments “averaging $14,780 a year for individuals and $22,000 for couples” won’t bridge the gaps. Suicide is the dark side of the student lending crisis and, despite all the media attention to the issue of student loans, it’s been severely under-reported. I can’t ignore it though, because I’m an advocate for people who are struggling to pay their student loans, and I’ve been receiving suicidal comments for over two years and occasionally hearing reports of actual suicides. Student loan levels have skyrocketed over the past three decades, and now the labor market is not producing enough good entry-level jobs to absorb heavily-indebted graduates, many of whom owe $100,000 or more in principal alone. If we need more evidence of this deeply human crisis, the meltdown of the European economy has been linked to rising suicide rates of workers who see no escape from their plight. Nadeau began her piece with three stories of three Italian workers who committed suicide due to their personal financial struggles. I suggest checking it out if you want a clearer sense of the human costs of the recession. It was an easy way of dismissing the widespread despair and fear caused by an inhumane system that contributed to the world’s second highest suicide rate. East Germany, of course, was under a communist rule that sucked freedom and enterprise out of everyday society. When life under that oppressive regime caused people to sink into hopelessness, the government decided it was time to blame the victims. To some, this historical factoid might justify touting unbridled capitalism as a panacea to heavy-handed government. However, while I have little use for communist systems, America’s suicide statistics remind us that extreme despair transcends economic and political ideologies. We have to create jobs, while maintaining programs for those in need. When America faced the Great Depression of the 1930s, the federal government enacted the New Deal legislation that created a stronger social safety net, including the minimum wage, Social Security, and public insurance for our bank accounts. It also created massive public works programs, funding everything from construction projects to artistic works. Ironically, it was this influx of government spending, followed by the huge increase in public expenditures necessary to fight the Second World War, that saved capitalism and put America on path for its greatest era of prosperity. Today, many large corporations are sitting on piles of cash, and the stock market has fully recovered from the massive hit it took during the meltdown. Meanwhile, the unemployment rate improves in tiny, incremental steps at best. It’s not as if we’ve run out of important, meaningful work that needs to be done. If corporate America and Wall Street won’t create jobs despite their abundant earnings, then let’s tax their wealth and use the proceeds to put people back to work, fixing our bridges and roads, building connective public transportation systems, educating our children, providing affordable health care, safeguarding our communities, and caring for our elderly. Whether it’s biochemical or situational, the net result is the same: People are stressed to the max, financially struggling, pessimistic about their prospects and don’t have the traditional means of support previous generations relied on to get them through wars, epidemics and economic downturns. In the past, people had family and community to turn to for support and strength and hope. Today we’re a fractured society, with families strewn around the country or globe, and our ancestors’ belief that “family is glue” all but eroded. Even people who didn’t have close family had strong religious convictions or a network of neighbors. We’re a Velcro society, and we all know what a weak substitute that is. Suicide is a scary, intimidating, and complicated topic, and it makes many of us uneasy. But a nation’s suicide rates should be among the prime indicators of its collective health and well-being. We need to “own” these statistics, understand what’s behind them, and do our best to respond to them. This will enhance our lives a lot more than obsessing over stock market reports and enabling corporations whose leaders don’t give a hoot about the rest of us. This blog posts builds upon, draws from, and integrates a good half dozen pieces written over the past two years. It is a sad testament to the state of things that the ties between mental health, suicide, and the economy continue to be so relevant. Sometimes there is warning, other times disaster strikes unexpectedly. What are best practices on an issue like this? The following stories from the Workforce archives as well as several related Forum Discussion posts offer perspective on how to cope when a disaster hits. I wish it wasn’t so necessary to do contingency planning for disaster. But as the Marathon bombings in Boston last month and the powerfully destructive tornado in Moore, Oklahoma remind us, being prepared can save lives. Saying he wants the University of Massachusetts to do better, Chancellor Kumble Subbaswamy has launched a campaign to address workplace bullying. In a memo sent to faculty and staff Thursday, Subbaswamy wrote that the university will be taking steps to deal with the bullying at UMass that came to light in a survey released in September. “While the numbers were consistent with those found at workplaces of all types throughout the country, this is clearly an area in which UMass Amherst aspires to be something much better than average,” Subbaswamy wrote. A week ago, labor-rights group Working America launched FixMyJob.com. . . . The website is yet another attempt by the country’s once-powerful union movement to connect to workers in an increasingly hostile national workplace. The site, which is being rolled out slowly and in stages, is meant to give workers the resources they need to organize themselves and demand changes—regardless of whether or not an actual union comes together. American workers are under assault, and this will continue so long as they believe that rugged individualism, supported by benevolent employers and the HR office, will provide them with good, secure jobs and decent working conditions. Splitting is the tendency of those with [borderline and narcissistic personality] disorders to view others as all-good or all-bad. It’s an intensely emotional and defensive dynamic – and it can become highly contagious in the workplace, whether the person is a customer, employee, supervisor or even business owner. Eddy describes splitting in work settings as a personal and hostile process that promotes extreme, all-or-nothing positions and “often involves projection,” i.e., tagging “others as being divisive and inappropriate in the ways that they are actually being divisive and inappropriate themselves. All-good vs. all-bad thinking is hardly the province of those with borderline and narcissistic personality disorders, and I’m guessing that most of us have fallen prey to it on occasion. But when this mode of thinking morphs into targeted and virulent action, the results can be destructive. They can range from defining entire occupational cultures — witness the malignant political discourse of Washington D.C. — to individual campaigns of workplace bullying designed to ostracize someone and drive her out of an organization and/or profession. In the latter category, they often include what I’ve called “puppet master” bullying and mobbing behaviors that attempt to turn the many against the targets and sometimes succeed. It’s pretty much a given that top-down workplace bullying can diminish morale and productivity. But a study of Brazilian workers presented at the just-concluded “Work, Stress and Health” conference in Los Angeles suggests that abusive bosses may reap what they sow. Dr. Kenneth Harris of Indiana University-Southwest (with Drs. Ranida Harris and Ana Rossi) presented a study on the effects of sustained abusive supervision on work outcomes, using a sample of Brazilian workers. One of their key findings is that many targets engaged in “upward undermining” as a response to the abuse. In other words, bullied workers did what they could to make their bosses look bad. Interestingly, as the bullying got worse, some targets increased work efforts on their own behalf, which Harris suggested may reflect attempts to keep their jobs despite the onslaught of mistreatment. It makes sense, especially with bosses who have a kiss up, kick down mentality: They so underestimate the importance of subordinates that they have no idea about the little ways in which targets of their abuse can withhold support or even quietly sabotage their work and reputation. The biennial “Work, Stress and Health” conference is co-sponsored by the American Psychological Association (APA), National Institute for Occupational Safety and Health (NIOSH), and Society for Occupational Health Psychology (SOHP). I’ve been asked twice in the past few days about bullying in the voluntary sector. This appears to be largely unexplored territory, deserving of greater attention. I searched “bullying of volunteers” and found only a smattering of relevant hits, and nothing in terms of a full-blown examination of the topic. 1. Why not? — There’s no reason why bullying-type behaviors should be uncommon among and between volunteers as compared to people in other settings with frequent human interaction. Most organizations have tensions, conflicts, and rivalries. Why should it be any different with those heavily staffed by volunteers? 2. Emotional stakes — In fact, in some cases the emotional stakes may be even greater among pure volunteers than among paid staff. For example, in hyper-charged, cause-type situations, emotions can run especially high and play host to all sorts of negative behaviors, running the gamut from conflict to incivility to bullying. If the volunteers are working on behalf of a cause in which they have an important personal stake, the emotional ante is ratcheted up and buttons may be easily pushed, especially with “underdog” issues where people already feel marginalized. Conversely, if the volunteer activity is associated with high levels of community prestige or power, there may be a lot of competition and posturing that create their own drama and give rise to the possibility of bullying behaviors. Ambition and recognition are not limited to paid employment, after all! And even if social change or prestige isn’t at stake, community connections may well be. For many, volunteer activities such as coaching youth sports or organizing a church choir may be lifelines to their communities, and being cut out or pushed out of them may be painfully isolating. 3. Institutional status — The bullying of volunteers raises all sorts of institutional status questions. Are we talking about rank-and-file volunteers who are doing the on-the-ground grunt work? Or maybe this is about bullying within non-profit boards? Are there differences between all-volunteer groups and those that have a mix of staff and volunteers? And what if bullying behaviors cross certain groups within these organizations, involving staff, volunteers, and board members? 4. Behaviors — The bullying of volunteers also raises questions of specific behaviors: Do they lean toward direct or indirect? Do the emotional elements of some volunteer-driven causes plant the seeds for mobbing-type mistreatment? Given the increasing role of the Internet in linking volunteers, is online bullying more common than in, say, brick & mortar work settings? We may not know a lot about bullying in the voluntary sector, but we should be taking the experiences of volunteers more seriously. Americans of all ages, all conditions, and all dispositions constantly form associations. They have not only commercial and manufacturing companies, in which all take part, but associations of a thousand other kinds, religious, moral, serious, futile, general or restricted, enormous or diminutive. The Americans make associations to give entertainments, to found seminaries, to build inns, to construct churches, to diffuse books, to send missionaries to the antipodes; in this manner they found hospitals, prisons, and schools. If it is proposed to inculcate some truth or to foster some feeling by the encouragement of a great example, they form a society. Wherever at the head of some new undertaking you see the government in France, or a man of rank in England, in the United States you will be sure to find an association. In other words, voluntary associations are a societal cornerstone, and a lot of folks devote time to them. Their experiences as volunteers not only impact them personally, but also have a ripple effect on our communities in general. It follows that we should understand the significance of when and how working relationships among volunteers become dysfunctional and even abusive. In January, I wrote up a list of research ideas about workplace bullying and related topics for scholars and graduate students, drawn from past blog posts. I definitely would add bullying of volunteers to the list. As I explained in that earlier blog post, I’m not a social science researcher. But I’d bet that many of the quantitative and qualitative research approaches used to study workplace bullying would apply easily to examining the bullying of volunteers. Labor attorney and law professor Mitchell Rubinstein’s 2006 law review article, “Our Nation’s Forgotten Workers: The Unprotected Volunteers,” explains the precarious legal status of volunteers in terms of workplace protections. I’m spending an extended weekend in Los Angeles, attending and participating in the biennial “Work, Stress and Health” conference co-sponsored by the American Psychological Association, National Institute for Occupational Safety and Health, and Society for Occupational Health Psychology. 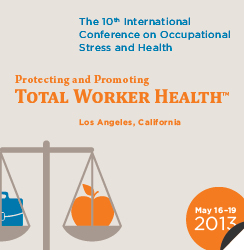 This year’s conference theme is “Protecting and Promoting Total Worker Health,” and the agenda packs in four solid days of speeches, panel discussions, symposia, workshops, and poster presentations. Despite its serious sounding title (anything with “stress” in the name tells us something, yes? ), Work, Stress and Health is my favorite larger-scale conference. It’s where I learn the most from fellow participants, and it’s where I’ve had opportunities to present my work to knowledgeable, savvy colleagues. First, it’s multidisciplinary. Although the fields of industrial/organizational psychology and occupational health psychology frame the overall conference, it draws presenters and attendees from many occupations related to employee relations. Tackling the challenges of making our workplaces healthy and productive requires input from many different perspectives, and this conference does a very good job of bringing many of them together. Second, it’s relevant to both research and practice. Academics and graduate students form the largest cadre at the conference, but the programs typically carry significance for scholars and practitioners alike. Equally important, most people drawn to this conference bring a genuine respect for both research and practice. Third, it’s friendly. Frequent conference goers understand the significance of that statement. Too many such gatherings are cold, stuffy, uptight assemblages, and I greet them with dread. Work, Stress and Health manages to avoid that look and feel. I actually look forward to being a part of it. Fourth, it’s a great place to learn. Here, too, conference devotees get what I mean. Frankly, at some conferences, all you really care about is not saying something really stupid during your own presentation. The rest of the conference holds scant interest to you. By contrast, at Work, Stress and Health, there’s a lot of compelling stuff being presented, and not infrequently one has to make a choice among two or three appealing programs during the same time slot. Finally, it connects and reconnects me with good people. This conference enables me to reconnect with valued associates and make new ones. 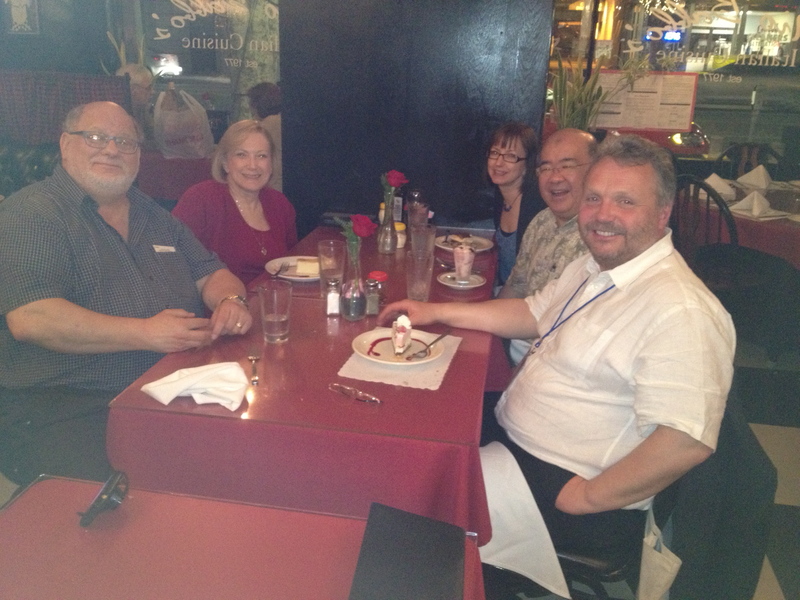 Indeed, last night I joined long-time friends Gary & Ruth Namie (Workplace Bullying Institute), Kathy Rospenda (University of Illinois-Chicago), and Stale Einarsen (University of Bergen, Norway) for an excellent dinner and lots of story swapping at Mio Babbo’s Ristorante in Westwood Village. These folks are among the pioneers in helping us to understand workplace bullying, and I always enjoy their company. I look forward to sharing several future posts summarizing and commenting on information and research presented at the conference. Let’s say you’ve got a cause you care deeply about, and you want to move it forward. It may be an initiative at work, a political issue, a community concern, or something else that matters. You may be at the beginning, in the middle, or tantalizingly close to success. 1. Be responsibly bold — I’ve been using this phrase a lot in talking about social change. Real change is neither reckless nor timid. 2. Take a next step — If you’re stuck, take a next step. It doesn’t have to be the next step, but it should be an affirmative one. It may lead you to something significant. 3. Put it on paper — Writing out your ideas pushes you to think logically about your passion. Let your right brain inspire your left brain, and vice versa. 4. Persevere — Sounds obvious, right? Well, if you’ve ever seen the resume of a very smart, able individual whose work record is a long list of short gigs, you know what I mean. Or maybe it’s someone who cares deeply about a cause but keeps addressing it in stops and starts or by constantly switching gears. Chances are they’ve never stuck with something long enough to make a deeper impact. 5. Learn — Change agents are lifelong learners. Pick up a book, talk to people (and listen! ), dig into that website, read that journal article, scan the paper, watch a documentary, just keeping learning. A key to your initiative may be in the next study you read. 7. Take a break — Burnout is real. Sometimes the best step forward is to step out for a bit. 8. Plan, do, evaluate, repeat — A good mantra to follow. 9. Celebrate victories, then get back to work — If you celebrate too long, you risk deluding yourself that the task is over. If you don’t celebrate at all, you’ll be pretty glum and miss a chance to recharge your spirit. So, take occasional bows, and then ask what comes next. 10. When despairing, dig deep — Changing some small part of the world for the better can be challenging, frustrating, and difficult work. Setbacks are almost inevitable. When they occur, dig deep . . . perhaps into your devotion to the cause, your faith or spirituality, or your connection with others who share your commitment.